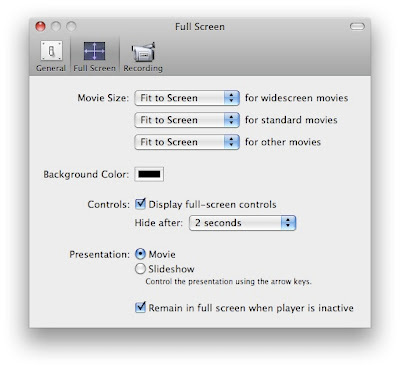 A New Mac Tip Every Day: Full Screen in QuickTime! I don't know if this is exclusive to Leopard, it might be, I haven't tried it in Tiger. It is possible to have QuickTime stay in full screen even if you switch to another application. This is very useful for using instant messaging while watching a video full screen. The feature is "Remain in full screen when player is inactive".